When celebrating Thanksgiving tomorrow, be sure to think about all of the ways wetlands provide for you and yours. Whether you enjoy the serene experience of watching a sunset through bald cypress trees, catching redfish in the marsh with your family, or simply love a good shrimp po-boy, Louisiana wetlands provide a huge number of services to millions of people daily. In addition to protecting our cities from storm surge, wetlands of all kinds host tremendous species diversity, are highly productive, and allow for many types of recreation. Louisiana provides seafood nationwide. All of our most profitable species use wetlands for some part of their life cycle. 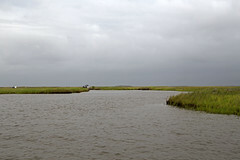 For example, shrimp spawn in estuaries, crawfish spend their whole semi-aquatic lives in freshwater wetlands, and oysters occupy coastlines while providing some wave attenuation and water filtration. CWPPRA and our partners see oysters as an alternative method to protect our some parts of our coast with artificial reefs that can also be harvested, making them a highly sustainable food source. Some foods we receive from wetlands aside from seafood include turtles and ducks in some cases, rice (a staple in many cultures worldwide), and a wide array of other plants for their tubers or berries. Beyond the food, though, wetland benefits include flood protection to our major cultural hubs and carbon sequestration. Sequestering carbon makes wetlands wildly productive and an ally in the fight against global climate change. CWPPRA was written into law in 1990 to help preserve these bountiful ecosystems so they can continue to thrive and benefit people in Louisiana and beyond. This holiday season, even if you are not eating any seafood during your feasts, you are benefitting from wetlands, so say a thank you for all of those natural areas that give us so much.